Are there any other marks on the side, they would be small, I have never seen a green leaf mark, I do not think it would be fukagawa with that type of mark, look at www.gotheburg.com and search Japanese marks. 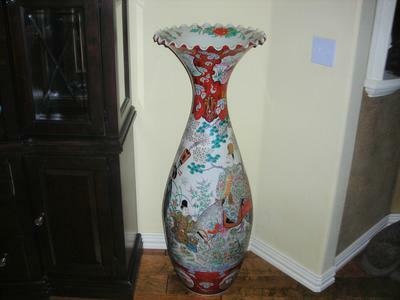 As this vase seems to be Japanese, I cannot help. Maybe another visitor knows it. You should upload at least some closeup pictures of the decoration and the foot, to allow viewing of details.